Dimensions 0.75 by 6 by 10.50 in. The Hugo, Nebula, and National Book Award-winning author of The Left Hand of Darkness presents a third collection of nonfiction writings, including essays on such topics as Tolstoy, Tolkien, women's shoes, Mark Twain, family life, and beauty, as well as autobiographical writings and reflections on the arts of reading and writing. Original. 15,000 first printing. Amazon.com description: Product Description: Join Ursula K. Le Guin as she explores a broad array of subjects, ranging from Tolstoy, Twain, and Tolkien to women's shoes, beauty, and family life. With her customary wit, intelligence, and literary craftsmanship, she offers a diverse and highly engaging set of readings. 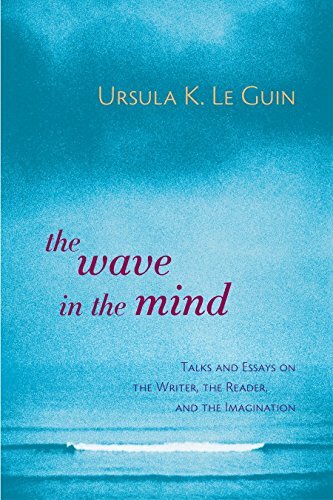 The Wave in the Mind includes some of Le Guin's finest literary criticism, rare autobiographical writings, performance art pieces, and, most centrally, her reflections on the arts of writing and reading. About: The author presents a collection of nonfiction writings, including essays on such topics as Tolstoy, Tolkien, women's shoes, Mark Twain, family life, and beauty, as well as autobiographical writings and reflections on the arts of reading and writing.